So, you want to learn to pilot a drone, but aren’t sure where to start? Gizmodo ordered a fleet of beginner’s drones and handed them off to a total drone newbie (me) to test. The best and worst of what I found—plus many, many crashes— is all ahead. If you want to find the real best drone for a beginner, then it only makes sense to assign a beginner as a test pilot. That lack of qualifications is exactly how I ended up with my own little fleet of entry level drones to test pilot. And—after many flights but many, many more crashes—I’ve got the verdict on what’s best and worst out there for the beginner drone pilot. Setting this drone up was fiddly, and I didn’t think I was going to like it out-of-the box at all. Once I got it up into the air, though, this was my clear favorite. In the air, it was speedy and quiet. It also had far and away the most thoughtful design of the drones I tried, with plenty of clever details like a plug-in rechargeable battery replacing the on-off switch. Navigation was easy—although when I did crash it (FOR SCIENCE), it quickly showed itself to be durable as well. The CX10 looks and feels a little like it came out of cereal box, in an alternate universe where cereal boxes have really great toys. 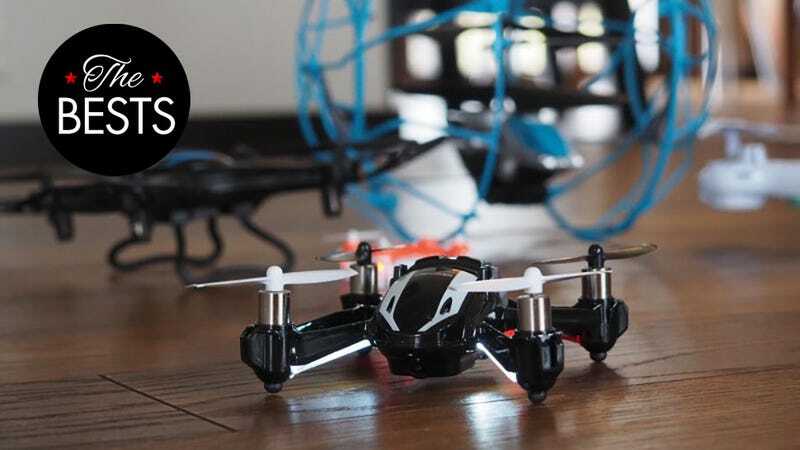 It’s cheap, adorably tiny, requires no out-of-the box assembly, and is a fun, casual way to introduce yourself to the world of drone piloting. The X5SW was, by far, the most powerful of the drones that I tried. In fact, full disclosure, it was a little more powerful than I anticipated and on my first flight I promptly crashed it into a tree and had to hop a fence to retrieve it. Going by the crunch I heard on impact, I’d expected to have at least lost a propeller or two. But when I eventually found it, it was in perfect condition despite having crashed not just into a tree but also having crashed hard on the driveway. That speed and power comes with a flipside though: Navigation can be a bit of challenge for the true beginner (me)—fortunately, it held up just as beautifully through subsequent crashes (into the ground, the street, a close call with the underside of a patio chair). The longer I used it, the easier navigation became and I can definitely see someone with a little more drone experience loving this right out of the box. buttons on my controller was misaligned and extremely hard to press. Kirk’s ship in miniature can get knocked around by a strong wind thanks to an unbalanced chassis made of styrofoam, but that also means it won’t wreck your walls if you decided to reenact Wrath of Khan in your living room. But who cares about balance. It’s the star ship Enterprise. Boldly take this drone where no drone has gone before. It’s not the coolest or the quietest or the cheapest drone available, but our former pick for Best Overall Drone is the only one that you can fly into a plasma TV, at top speed, without a care in the world. This little guy will make a lot of drones look like blimps in comparison, but between it’s hobby-grade motors and lightweight frame it’s blazing fast. It also allows you to turn off the gyroscope to do away with stabilization and get to performing wicked cool stunts. That’s why it was our previous choice for Advanced Beginners. The tiniest drone no longer! But this little guy is still adorable, and it’s well-designed prop guard means you’ll be less likely to kill friends and family as you send it whizzing all over the house like a giant ladybug. This drone was easy and pleasant to pilot. The legs on the bottom gave it some of the Rollercopter’s buoyancy with none of its navigational problems. The one standout problem was the noise—seriously, this thing beeps like a fire alarm. Overall, though, it was quite a solid effort that I like just fine. Earlier, I said the CX 10 felt like a toy, as a compliment. Now, I say it again about the AirHog Rollercopter—but this time as the bitterest of insults. The controls feel flimsy; the navigation is barely responsive; the design is so clunky it’s almost puzzling—until you read in the manual that (unlike most of the drones we tried which are aimed at a teen and over crowd) this one is for ages 8+. Suddenly, everything from its crash-proof cage to its battery-powered charging cable begins to make a kind of terrible sense: This is a kid’s toy and, frankly, a bad one. On the plus side, once you do get it up into the air, the surrounding cage does look cool flying overhead like an orb—and it’s not just decorative. I sent it crashing down over and over again, and somehow (though not for lack of trying) it still managed to avoid total destruction. I’d count it as a rare perk for this drone, if that same cage hadn’t also managed to capture a blade of grass during our test and wrap it around its propellers, sending the whole thing falling out of the sky like a stone. Don’t bother with this larger $25-$50 version of the Syma X4. It’s a teensy bit more powerful, but not enough to reliably fly outdoors. It doesn’t last longer, and it’s noisier and looks uglier. The propeller guard is removable, but wound up removing itself at inopportune moments.